Writer/director/producer Shawna Baca is a self-taught filmmaker, with experience in short films, spec commercials, and webisode development. 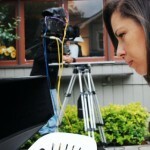 She leveraged that experience into wider exposure and success, ultimately putting together her own production company. Baca’s appreciation for storytelling has deep roots. “I was raised by my Yaqui/Apache grandmother for the first four years of my life before going to live with my mother. Storytelling was always an important way for me to learn about our history, or things going on in the world around me. I used to love sitting around waiting for my mother or grandmother to tell me a great story. It always whisked my imagination to a wonderful place of make believe and that place is where I felt emotionally invested, fulfilled, happy or aware. Story can have universal appeal and meaning, of course, but a good story will not necessarily translate into a commercial success. We asked Baca if there are distinct story values that may appeal to an ethnic or diverse market, rather than a broad, generic demographic. How does a writer/storyteller develop these kinds of stories? “I think this is the million dollar question,” she answers. “Ideally, I have always considered myself American. I had no idea how much culture I had embedded in me until I started writing my own material.” Initially she wrote a lot of material with Native American or Latin leads. “But then,” she says, “people would consider it a small film, small budget, an independent film. Recently, I co-wrote a screenplay that has two Latin leads. We had a table read for the film and received some great feedback, but most people thought of the film as a small art house film that had no commercial value. In 2004 Baca created the American Latin Film Festival. She says that at the time studios were recruiting great directors from other Latin countries, but American Latino directors almost seemed to have no voice or presence, with the exception of the few like Robert Rodriguez, Franc. Reyes, and Rodrigo Garcia. Check out Shawna Baca’s website and her reel.